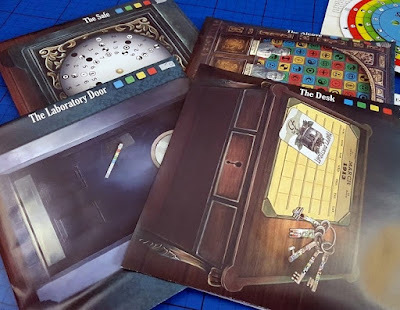 The Crystal Maze meets Sherlock Holmes is my best explanation of our latest game review for ThinkFun. Escape The Room: The Secret Of Dr Graveley's Retreat is a one-time only evening of mystery and puzzle-solving for 3-8 players aged 13+, with the main aim being your own escape! Inside the box is everything you'll actually need to play the game and it requires no preparation at all, but you are encouraged to set the scene and you can really go to town if you wish. Our guests were our two oldest kids and weren't really up for dressing up (or photos), but we did at least let them choose some period music... our scene was set in 1913, so they were a mere 100 years out. It worked though. The instructions are really simple and the host has nothing to do until all of the guests arrive, when they read out the first background scene card. The first part of the story explains why you are all present and that you are a group of strangers who are all just getting to know each other. The players are extras in the story, so you are free to develop your own character or not, depending on how immersed you wish to be. All of the characters become locked into a room together at the beginning of the story, at which point a timer is started (we had 4 players and 2 hours), the game has begun and your task is to spot the clues and solve puzzles to escape. As you complete puzzles you move on a step, and at each stage you are given fresh background and storyline. Using everything you have found you have to piece together the evidence and solve the mysteries. Your eventual escape (or not) depends on it. Clues are stored in sealed envelopes which are opened only once you've solved the clues and entered your answer into the solution wheel. It's a very clever way of checking for a wrong answer without revealing the whole story and ending your game early. The clues are excellently done. 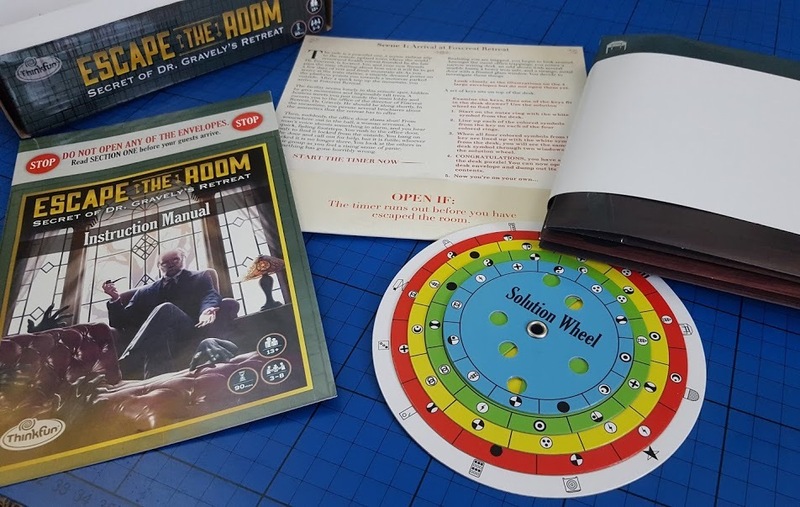 There are many different formats represented including text, logic puzzles, physical puzzles using string, and the most amazing cardboard props which replicate in miniature real life items in the game - doors and furniture or keys and even people. Escape The Room: The Secret Of Dr Graveley's Retreat is an excellent game and the four of us really got into it. 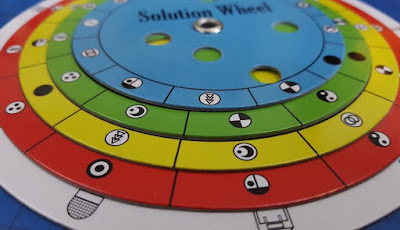 It took us the 2 hours to play and we all solved a pretty even number of clues, discovering a real ability for physical logic puzzles in my eldest son! 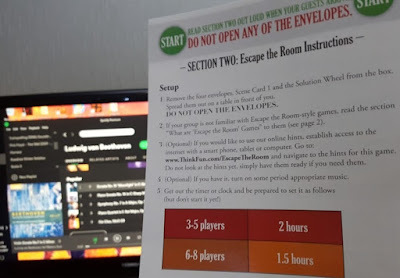 We DID escape the room - with a bonus - and we had a great evening doing it. There are hints online if you are stuck, but we didn't need them thankfully. 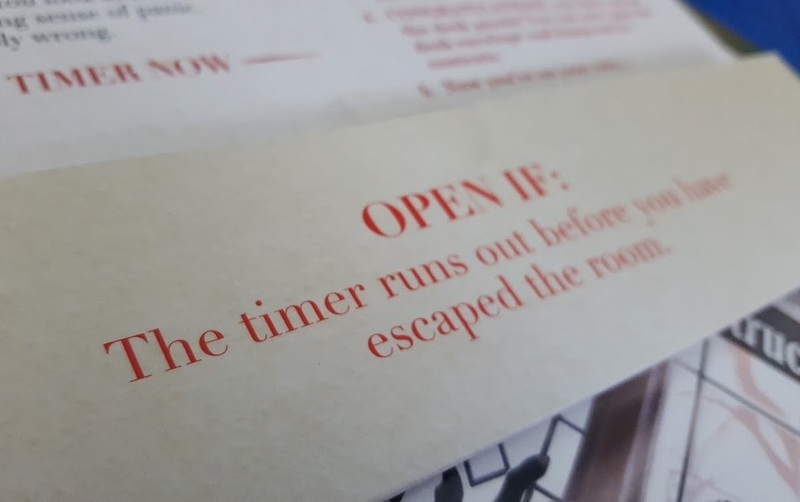 The time limit does add increasing tension as you play, especially whenever you realise a solution only leads to another clue you weren't expecting. We loved it. This was a brilliant game to play with our older children and would definitely make a great evening for a group of friends. You need to work together and bring your own skills and point of view in order to crack all of the different styles of puzzle. The game pieces are gorgeous, beautifully drawn and very clever. The storyline is fairly obvious and a bit 'horror movie', but as a bystander you never really delve too deeply, you simply need to escape. 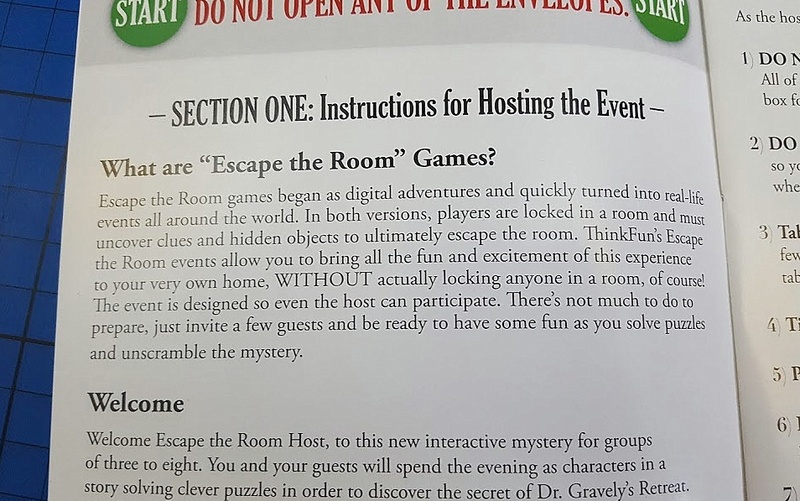 The only disappointment is that once you've solved Dr Graveley's Retreat, you can't re-play. 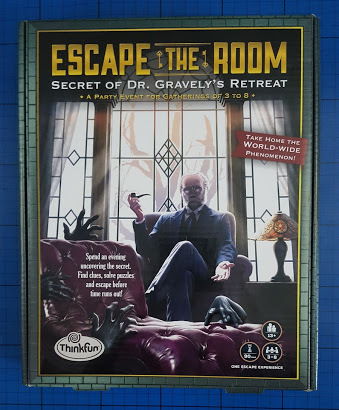 Escape The Room: The Secret Of Dr Graveley's Retreat is distributed by ThinkFun, suitable for 3-8 players aged 13+ and available to buy now priced around £14.99, instore and online including Amazon. Excellent value for a very different night's entertainment. 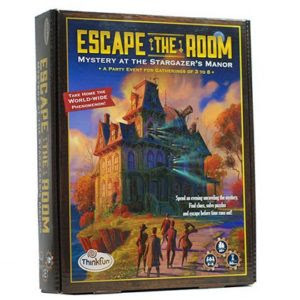 To take a look at another of the Escape The Room games, check out these reviews of Mystery At The Stargazers Manor on the blogs by Blue Bear Wood and Susan K Mann. 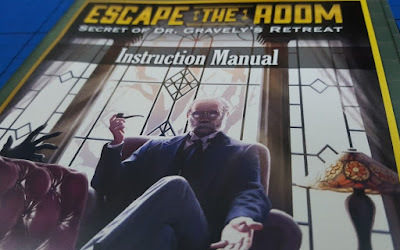 We were sent our copy of Dr Graveley's Retreat for review.